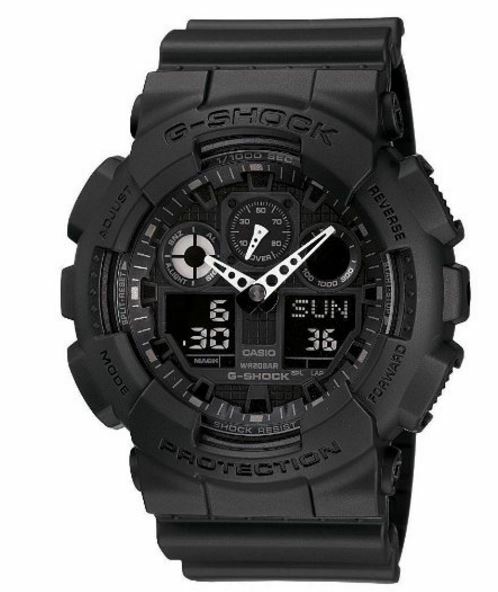 Are you looking for the best G Shock Watch for Men? The Timely Gentleman has you covered. Its easy to get confused by all the different models offered by Casio. Each model is available in different faces, digital, analog, colors. Its really easy to be unsure which G Shock is the best for you. The Timely Gentleman has taken the confusion out of the G Shock shopping process for you! 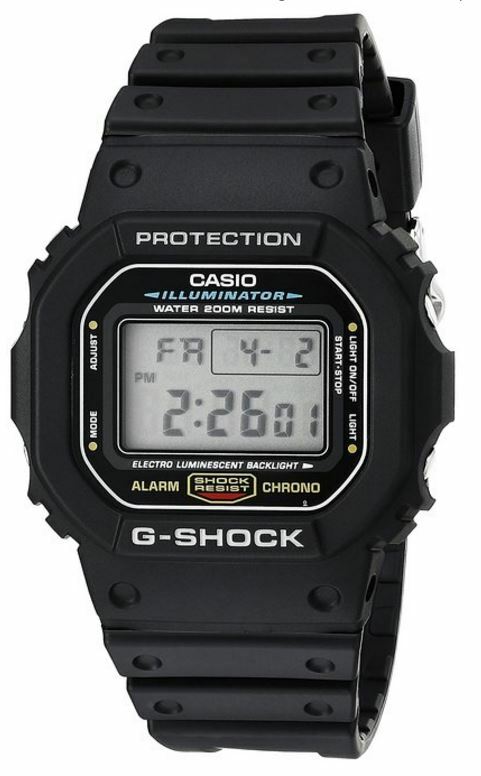 In the humble opinion of The Timely Gentleman, The Casio G Shock GW9400 Master of G is one of the most important Casio G Shock models in some time and could be the best Casio G Shock watch today. From a style, durability and functionality perspective, this one is hard to beat. While they may get better in the future, a modest investment in the Master of G will get you a great all purpose watch, at least for the near future. I love this watch so much I even did a special review just for it. Check out The Timely Gentleman Review of the Rangeman GW-9400-1CR here! The GA-100 brings it all back home with a world-time feature and stop watch that brings to mind the Citizen Skyhawk series with its dedicated readout windows below bold hands. 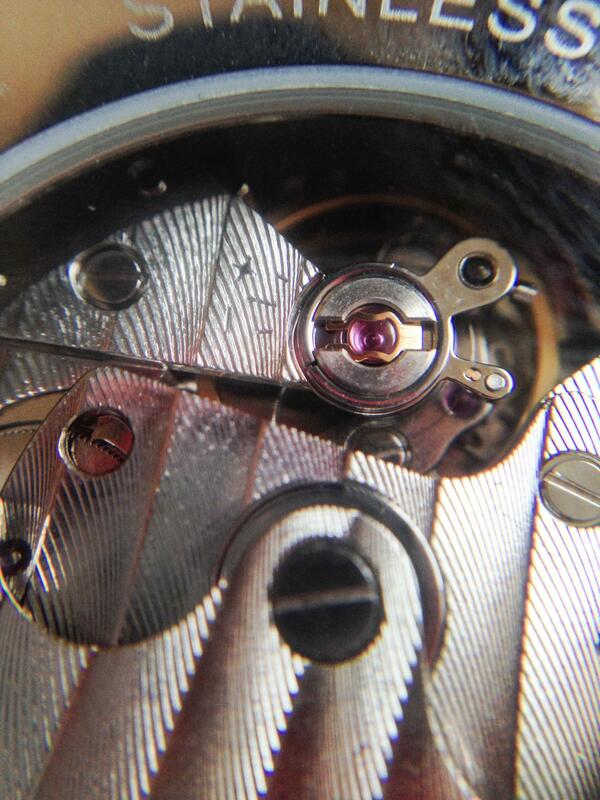 The so-called “Three Eye” design (I guess the three dials – one analog and two digital – are the eyes? Whatever) and huge hands make this thing quite readable. The watch is light – about 70g – the watch is surprisingly cheap at about $99. It has a 1/1000th of a second stop watch, countdown timer, 29 time zones, and four alarms. It is shock and magnetically resistant, so you can wear it in the hatch in Lost. For those who like to ride the waves and seek adventure within water, then Casio G Shock Men’s Watch can be an ideal companion and personal accessory, which can resist water up to two hundred meters deep. It can not only resist the water but the shock and Magnetic effects. 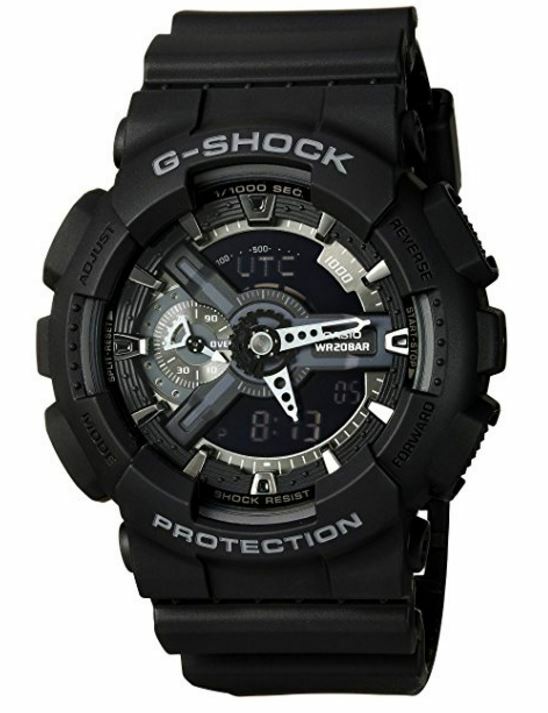 It has a fantastic Black Dial with comfortable Resin Strap. This watch has many features like Auto light switch, select-able illumination duration, afterglow and LED light, means you can easily view the time in dark places. This Casio Watch has Full auto-calendar, Hourly time signal, World Time and therefore you can do a Regular timekeeping with this watch. There are many other functions like stopwatch, Countdown timer, and multiple alarms which make this watch multipurpose. 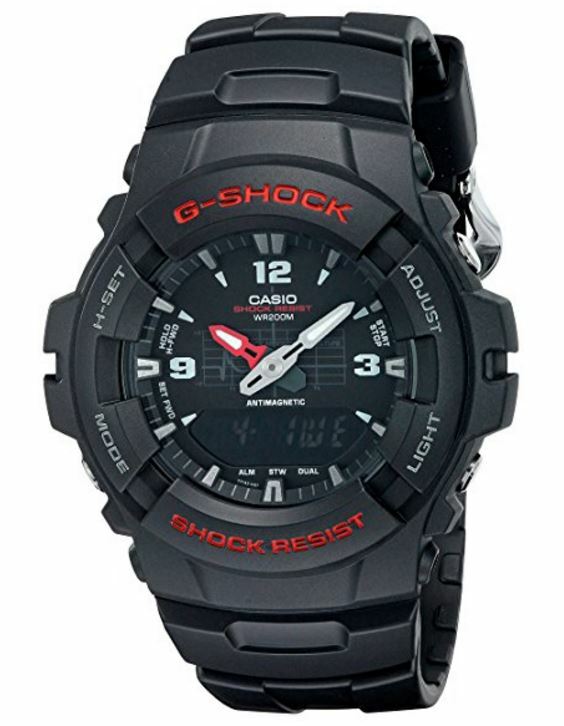 The simply designed Casio G-Shock Classic analog-digital watch for men features a circular black watch case in combination with a comfortable black resin sports strap. Its timekeeping features include a 1/100-second stopwatch with a 24-hour display and elapsed time mode, dual time for tracking a second time zone, daily alarm, and 12/24-hour formats. In addition the watch offers shock resistance for those who take an interest in vigorous sports activities and water resistance up to 200 meters (660 feet) that will continue performing even during swimming or scuba diving. Other features include an auto calendar (pre-programmed until the year 2039), ±15-second accuracy per month, afterglow back lighting and anti-magnetic properties. The G-Shock DW-5600E-1V is a true classic. It came out in 1996, and was heavily based on it’s predecessor, the DW-5600C. 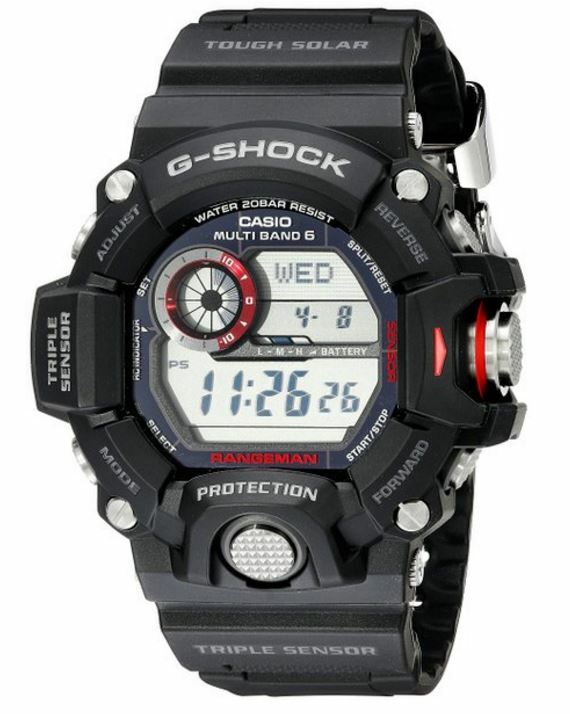 Being one of the original G-Shocks, it comes from a time before G-Shock made extremely bulky watches purely for fashion. This watch focuses purely on utilitarian purpose, which is something I have come to hugely appreciate about this watch. When You’re Ready to Buy The Best G Shock Watch! Now that you have thought about what you are looking for in a Casio G Shock for Men, Its time to share our top 5 picks for 2017. This page will give you an overview, and when you are ready to make a decision, you can click the link to be taken to Amazon! 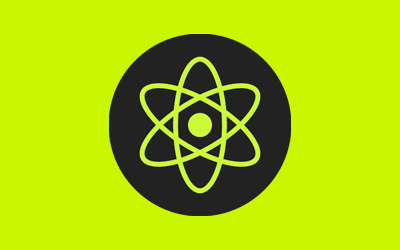 Be sure to check out our other reviews HERE!